Thundermaw Hellkite was the dragon that redefined the competitive dragon. The ambition behind the design of Thundermaw Hellkite was to create “a Dragon that set the standard for a badass Dragon“ as Doug Beyer laid it out in Mark’s preview article. And Thundermaw Hellkite achieved exactly that. Prior to Thundermaw Hellkite’s existence, the dragons that saw high-level competitive play were either too expensive to cast or contain a prohibitive mana requirement that restricted their playability to few archetypes. Thundermaw Hellkite broke the mold. She is a five casting cost 5/5 flier with haste and an enter the battlefield ability that ensures she and potentially your army could go in for the alpha strike. She was obviously pushed and was designed for the tournament tables. Yet her price trajectory during her first few months of being unleashed into the meta was nothing but dismal. After the hype surrounding Magic 2013 died down, Thundermaw Hellkite’s price tanked all the way to $10. How could the price of such a playable mythic stoop so low? We all know the answer to that: Thundermaw Hellkite was a mythic with no home in Standard. Indeed the reason Thundermaw maintained a price tag of $10 was the fact that she is a dragon and is from a core set. In October 2012, a couple of months after Thundermaw Hellkite’s release, and right after Return to Ravnica rotated in, Takeda Harunobu won a high profile Standard tournament in Japan with a Standard brew we now know as Jeskai Tempo (or UWR Tempo back then). Takeda’s deck featured two Thundermaw Hellkites alongside Geist of Saint Traft and Restoration Angel. In the middle of November 2012, Jon Bolding took down Grand Prix Charleston with a Black-Red ‘Big’ Zombies deck that featured three Hellkites in the mainboard. Tyler Lytle took down Grand Prix San Antonio the week after with the same deck. By December 2012, Thundermaw Hellkite was a $40 card and remained so until February 2013. Throughout her Standard shelf life, Thundermaw Hellkite saw play in a multitude of archetypes and was a quintessential staple of Innistrad – Return to Ravnica Standard. She even saw Modern play when the UWR Tempo archetype made its debut in Modern. Thundermaw Hellkite’s trend was not unique to herself of course. A handful of expensive mythics had at some point during their Standard life been sorely undervalued due to a multitude of reasons. Some stayed low for a brief period of time. Dragonlord Ojutai is a recent example. He was preordering for $6, began his first week in Standard under $10 and is $38 as of writing. Some remained low much longer. Remember the summer when Jace, Architect of Thought was under $10? On the other hand, a lot of mythics stayed in the under $10 region all the way until they rotated out of Standard and into the bulk bin. I was bullish on Duskmantle Seer after a BUG Aggro shell running four Duskmantle Seers briefly surfaced in the meta. Even Paulo Vitor Damo da Rosa had good things to say about the Seer, arguing that his symmetrical ability is asymmetrical in the right deck. When Duskmantle Seer hit $3, I thought he was too cheap. I bought two playsets for speculation and one foil playset for myself. As of today, they are collecting metaphorical dust in my bulk specs box. When we speculate on undervalued playable mythics, we are betting that those mythics would have their day in the sun before their time in Standard comes to a dawn. The following are three questions I use to evaluate the chances that an under $10 mythic would spike before its time in Standard comes to an end. 1. A Mythic in a Hostile Meta? Thundermaw Hellkite struggled to find a home during her first few months in Standard as it was the era of Blue-White Delver. If you were lucky enough to be able to resolve a five casting cost dragon amid Mana Leak and Snapcaster Mage, Vapor Snag would wreck your tempo. Once Mana Leak and Vapor Snag rotated out, the meta was Thundermaw Hellkite friendly and as a result she was able to spread her wings and soar to $40. Thundermaw Hellkite’s dominance (in tandem with that of Falkenrath Aristocrat) kept Jace, Architect of Thought out of the metagame. Once the hasty fliers rotated out of Standard in October 2013, Jace proliferated throughout the metagame in Blue-based control decks and Mono Blue Devotion. 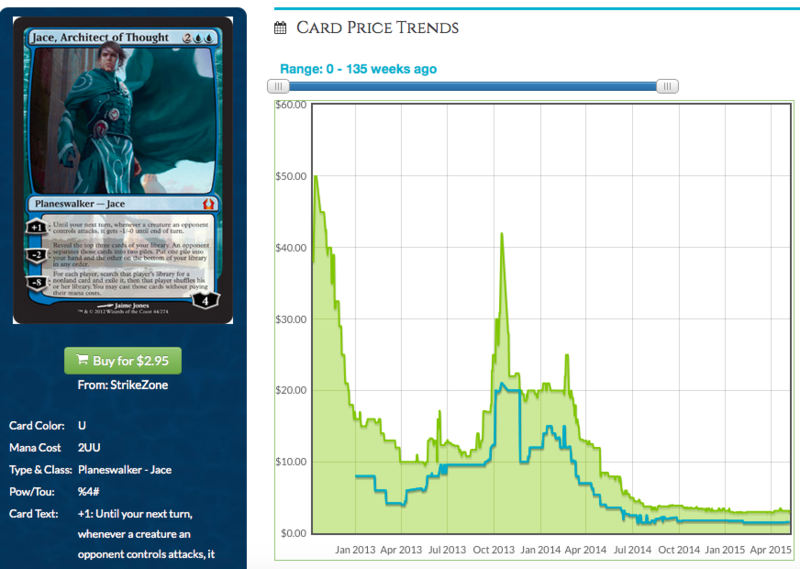 His price spiked to the $30s briefly and hovered around the $20s until the release of Jace vs. Vraska. Xenagos, the Reveler and Ashiok, Nightmare Weaver both spent time as $7 mythics. Both spiked above $15 when a new Standard was ushered in last fall. Are there any inherently good mythics that are currently undervalued because they do not have a home in the metagame? Sarkhan, the Dragonspeaker is just $7.55 at the moment. 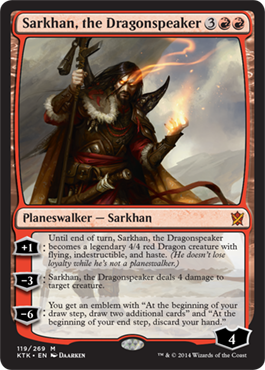 Sarkhan is competitively costed, defends himself and is a game finisher but he is not the card you want to cast in a metagame where Hero’s Downfall is prevalent. Could Sarkhan soar to $20 once Hero’s Downfall falls out of Standard? Sarkhan, the Dragonspeaker smells like a good summer pick-up. 2. Does the Mythic Carry the Game by Itself? A card that requires synergy to tap into its full potential is unlikely to be played in multiple archetypes. Build-around-me mythics have a significantly lower chance of spiking due to the reduced probability of them finding a home. Duskmantle Seer was a good example. He requires you to maintain a low curve in your deck to optimally exploit his Dark Confidant ability. The reliance on synergy was the reason I did not buy in on the Master of Waves spike when Shorecrasher Elemental was spoiled. It was tempting to buy into cheap Master of Waves in case Blue Devotion becomes a thing again, but too much hinged on the success of a single deck for that bet to be worth making. Every card listed on point one above are good cards even by themselves. 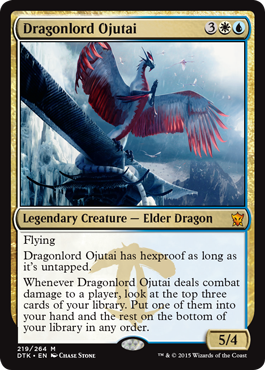 Dragonlord Ojutai is a card advantage machine all by himself, allowing him to be one of the most ubiquitous mythic in the current Standard metagame. Of course we get a card that occasionally bucks the trend. Falkenrath Aristocrat’s spike hinged solely on the popularity of The Aristocrats archetype but she was an exception rather than the norm. 3. Does the Mythic have a Snowball Effect? The card advantage you get from each activation of Jace, Architect of Thought or each time Dragonlord Ojutai connects makes it more likely for you to activate or connect the second time around. And the third. Eventually the card advantage from those effects propel you sufficiently far ahead in the game that your opponent has practically lost even though his or her life point is still above zero. An undervalued mythic with a snowball effect is more likely to find a home and experience a price spike compared with a mythic that offers you a splashy, one-off effect. Incremental card advantage and board position win games. Sometimes the advantage those cards generate are not immediately obvious until you play with them. I am going to cheat and use a couple of Standard rares to illustrate this point. In my defense, the following are rares that started out their Standard lives being in the low single digit price range and eventually maintained a price above $15 for the majority of their Standard-legal life. Without playtesting with Goblin Rabblemaster, it was easy to overlook the fact that every turn Goblin Rabblemaster stayed on board puts you further and further ahead in board position. Every turn Courser of Kruphix remained unanswered could potentially lead to an extra card drawn and an extra life point gained. This question generally applies to permanents rather than spells. We do occasionally get a spell that allows us to chain card advantage. The first Sphinx’s Revelation you resolve increases your odds of hitting your second. In this vein, I like Sorin, Solemn Visitor as a pick right now and during this summer. Sorin is currently paying a visit to the valley of sub-$10 playable mythics. $9.40 seems too cheap for a versatile planeswalker that generates incremental card advantage and could be found in both Abzan Aggro and Abzan Control. Perhaps the latest iteration of Mardu Superfriends could be the next tier one contender in the format. Or we could even see Sorin and Narset side-by-side in Esper Control in the new Standard meta this October (I personally prefer Dragonlords). Sorin also has the additional upside of a relatively low spread of 36% as of writing. Those three questions cover only the main points in evaluating if a sub-$10 mythic has a good chance of spiking before it rotates. Other factors like Duel Deck reprint risk and set supply should be taken into consideration as well. I chose those three elements because they constitute a useful rule of thumb to help you decide if a cheap mythic is worth picking up. Those points were derived from the lessons I’ve learned from getting burned by Duskmantle Seer and the countless other mythics I spec’d on with hopes of an early retirement but are now destined to remain in my bulk spec box forever. Those points were distilled from the what little success I’ve had with Thundermaw Hellkite and a few other mythics which in retrospect seemed exceedingly obvious they were too cheap. Those were the points I used to evaluate Dragonlord Ojutai before coming to a conclusion that I should probably preorder him. Hello, everyone! I appreciated the response to my article last week, which I think exemplified one of my core tenets when it comes to MTG finance: playing it safe. There is plenty of money to be made in this game with proper planning and timing. What isn’t needed is speculation-fueled buyouts, huge positions in Standard cards that may take off tomorrow, or supply-side buyouts. Why go through all the trouble of that when there’s so much easy money waiting to be made, assuming that you have a little patience? As I explained last week, that’s why I love casual cards, and it’s why I focus most of my speculation decisions around that. I’m not the guy glued to Pro Tour coverage to see what gets mentioned early Friday morning and buying out whatever that is. I’m the guy playing Commander at the LGS and finding out what cards are going to still have demand for them in two years. Of course, with such a long time frame on these cards, it can be easy to forget about some of the good targets in this category and lose yourself in the Standard or Modern happenings. That’s why one of the things I like to do every so often is centralize all of these will-be targets in once place. Almost six months into 2015, now seems like as good a time as any. I’m sure I’ll revisit this at the end of the year with an update, but now represents basically the optimal buying opportunity on some soon-to-rotate cards, so this should be helpful in the short-term as well. Last week, I added a list of some cards that fill this category that were already seeing movement. I’ll repeat the list here for convenience. Akroma’s Memorial. The Magic 2013 version is at an all-time high of $12, and this was a $20 card before the reprint. It’s going to get there again. Nicol Bolas, Planeswalker is on a tear, and is almost $9. Again, we have what was a $20 card before a reprint. This has seen a lot of growth already this year, so it’s not quite as attractive, but this is going to continue to climb. Door of Destinies is at an all-time low of $3.50, and this will continue to climb back toward the $8 it was before the reprint. Rise of the Dark Realms sits at $4.50 after some momentum, and as a mythic, this one should rise at a faster clip than the others. Gilded Lotus is also at an all-time high of $6.50 (noticing a theme of “casual reprints in Core Sets?” and will be $10 within in a year. Looking further ahead, Darksteel Forge has three printings and hasn’t shown much momentum this year, but it fits the exact same mold as Gilded Lotus, and Darksteel versions of this used to be $12. Dragon Tempest and Dragonlord’s Servant are both on their way to bottoming out, and once they hit near-bulk status they become very good long-term players. Adaptive Automaton is showing some steady progress over the past three months, and is likely due for a correction upward within the next year. What do all these have in common? Besides being sweet casual cards, they also have all already seen at least a little movement, and in some cases more. While this is a great sign of things to come and represents a reason to get in, it also necessarily means less upside. There’s nothing wrong with this, of course, and all those are picks I like moving forward, but we’re not exactly getting in at the very bottom, either. Today, I hope to shed some light on those cards that are actually near the bottom. Getting in at the valley may mean a longer timeframe to cash out, but it also means maximizing profit. I know I said I was going to focus on 2015 today, but I can’t help but look back to last year as well. Don’t worry, I’ll keep it brief. Basically, I’d be remiss to talk about casual cards and not mention gods (holy crap, these are actually from 2013, huh? Getting old, here). Either way, these are basically mini-Eldrazi that will see growth over time, even if it’s not the momentous growth that Emrakul and friends saw. Of these, the mono-colored five are certainly good, but I feel like the upside may be more in the Born of the Gods and Journey Into Nyx copies that were opened much, much less. You already know the score on these, so I won’t dawdle. This bottomed out back in February (when it was my Pick of the Week on Brainstorm Brewery), but since then it’s climbed back to $6. I expect this will have to wait until rotation to go lower, but it’s well worth picking up then. It’s hard to know what the right call here is, but I imagine it’s the alternate-art printing, though neither is expensive and regular foils are trending toward $5. This thing is straight bonkers in Commander, and I don’t think that’s going to change anytime soon. Specifically, Dictate of Erebos (especially the foil) and Dictate of Kruphix (Game Day promo). These are solid Commander playables, and while they’re certainly going to take some time to move up, move up they will. Grave Pact is $8 after six printings. Dictate of Erebos has huge long-term upside. Again, a card that’s not cheap enough yet. It’s $9 but was $20 before the reprint. Standard play likely props this up a little, so if this settles down by rotation it will be a great pickup. The biggest reason? How nicely it plays with Cabal Coffers, forming the most dangerous combo of any black deck in Commander. I’ve talked about this several times, but for good reason. Every other five-color Sliver bomb is at least $15. This will be too. Again, a long-term gainer here. But Dragons, yo. People like them. This was $5 card before the reprint. Phyrexian Metamorph is $5 with one printing and a promo. Impersonator isn’t exactly that, but in practice it comes pretty close. On top of all that, it’s a mythic. As we’ve seen with sets like Zendikar and Innistrad, coming from “the most-opened set of all-time” isn’t the drawback you might expect. At $2 there’s a lot of upside on the Impersonator. This isn’t one I’m as hugely excited about, but it will certainly make its way into plenty of Commander decks over the next few years, and importantly, it is a mythic. It’s essentially a “dollar rare” these days, and it’s hard to lose at that price. Again, not one I completely love, but it’s worth noting that Cairn Wanderer is $2 so this could end up there one day, too, especially since it’s ostensibly better. Of course, this encompasses a lot. Looking at Dragons of Tarkir, I see a lot of cards that need to drop quite a ways before I get particularly excited about picking them up. That said, some are head and wings above the others when it comes to the long-term. The Dragonlords, especially Silumgar, Atarka, and Dromoka, are good casually. Ojutai is just plain good, but I can’t foresee this hitting a price that makes it worth picking up until at least rotation. Thunderbreak Regent is actually the clear winner, though again, it’s too expensive right now to want in on. But it has so many things going for it, not least of which is just being red and therefore more flexible, that it’s hard to not see this as the best long-term pick. I’m interested to see what happens with the Game Day promo of this card, because that’s definitely the most attractive version, as Guo Heng Chin touched on earlier this week. This definitely competes with Nykthos for the title of “best casual land currently being supported financially by Standard,” and it may actually surpass Nykthos in that regard. I hope every day that this gets cheap soon, because it’s just such an appealing target if it hits $1 to $2, even if we have to wait for rotation to get there. As sweet as the other cards in this set are, this may actually be the best in Commander. It’s finally starting to fall, and I can’t wait for this thing to bottom out. Rounding out our list today is a pretty solid zombie, which has both the benefit of being cheap and being mythic. Lord of the Undead is $8 after several printings, and while Executioner may not be that good, it’s still an extremely-solid zombie lord. Lots to like here. And that’s my list of casual targets for the past 18 months. There are a few lesser ones that are interesting, but this represents the best of the best. Until next week (when we have a full Modern Masters 2 spoiler), keep it casual! Not all speculation targets are created equal. Each card has a price, a trajectory, context within various formats, a buy-sell spread, historical baggage, print run considerations, and ever more factors influencing to what extent a spec is a “good buy” or not. It’s because of all these factors that you might choose to go deep on an unproven bulk rare rather than an established format staple, or to buy a staple even when most in the community believe it has hit its peak. At its core, all speculating comes down to one basic question: how risky is speculating on this card? Today’s article will be entirely a case study of Abrupt Decay, a card highlighted fairly frequently on MTGPrice in the last few weeks. We’ll be looking at many of the factors influencing this card’s price, all to determine: is this where we should be putting our money? The current Fair Trade Price on this card is $12.48 and the top buy price is $9.40. So, as a baseline, if we bought into this card today, the risk would be $3.08 per copy. Yes, the buy price can absolutely go down—and it probably will during the summer lull—but assuming no major unforeseen events, it’s hard to see demand for Abrupt Decay declining. Importantly, Return to Ravnica is not slated to be included among the sets drawn upon for Modern Masters 2015. As more players look into playing Modern, the staples that don’t get reprinted this year will all of a sudden have a little extra demand focused on them. Abrupt Decay doesn’t have any particular flavor that would make it difficult to reprint, but it’s also not the type of card that Wizards green-lights every day. The chance of a reprint seems extremely low to me, especially in a normal set. The most likely place, if any, we’ll see new copies of this in the next year or so is through judge or GP promos. How likely is it that Abrupt Decay declines in price due to its place in various metagames? Let’s start by pointing out that this is a two-color card, and one of those colors is not blue, which limits the amount of decks that can play it. That said, this is a very powerful effect, especially in eternal formats where low-drops rule, and it is not unreasonable to build your deck specifically to have access to this card. Standard: Crucially, this is not legal in Standard, so we don’t have to worry about rotation causing a sudden drop in price. Modern: MTG Goldfish lists Abrupt Decay as the 39th-most-played card in Modern. The last Modern Pro Tour saw a field of 30 percent Abzan decks, and it’s fair to say that most of if not all of them had access to this card somewhere in the 75. With Jund and straight Golgari decks also fairly prevalent, Abrupt Decay seems fairly safe to continue seeing action in Modern. Legacy: Abrupt Decay is the tenth-most-played card in Legacy, which is crazy, given that it can’t be pitched to Force of Will. Still, Jund and Sultai decks are big in the format, and Decay is important to keeping Counterbalance decks in check, too. It certainly doesn’t seem like the card is going anywhere. Vintage: Due to a serious lack of players and events,Vintage playability doesn’t necessarily impact a card’s price in a huge way (foils excepted), but it can indicate a card’s power level. In this case, Decay is the 38th-most-played card in Vintage, so there you go. Casual: Abrupt Decay is a fine card in Cube, and probably playable in Commander, though not exactly an all-star. Kitchen-table players will probably play any copies they own, but this doesn’t strike me as a card a casual player will see and think she must go out and purchase for her deck. 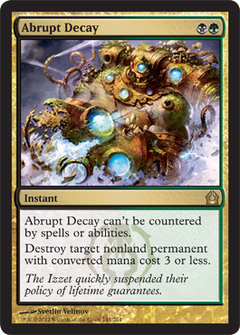 All in all, I think it’s fairly safe to call Abrupt Decay an eternal-format staple, with little to no value coming from casual formats or Standard. In my mind, this means there is very little risk of metagame changes completely crushing this card’s value. Let’s look at the blocks before and after Return to Ravnica to give ourselves a little context of what is possible and what we’ve seen before. Remember, Return to Ravnica was a large fall set. It was the first of its block, and Abrupt Decay was printed at rare. If we look a year earlier, we can see the most expensive rare in Innistrad. This bodes well. Thinking Abrupt Decay will hit $51.57 is ambitious—far too ambitious, if you ask me—but seeing Snapcaster this high at least shows us that Decay has room to grow. Innistrad and Return to Ravnica were similar in a lot of ways, especially with regards to the timing of their releases, the size of the playerbase, the popularity of the sets, the power level of the top cards, etc. Snapcaster Mage and Abrupt Decay are very different types of cards, but they are both similarly staple-tastic in all of the eternal formats. Snapcaster is probably a little more attractive in casual formats and it does pitch to Force of Will, which means that all other things being equal, Abrupt Decay probably never moves past Snapcaster in price. Now for the most expensive rare in Theros, which you can see is Thoughtseize. This is similar to Snapcaster and Decay in some ways, but also different in many. The similarities are easy: this is an eternal staple played in every single format in which it’s legal, and it is a rare from a large fall set in the same general era as Return to Ravnica and Innistrad. But the differences add a few twists to the situation. First off, this is a reprint. Before it was reprinted, the Llorwyn version was up to an insanely high $70. This was probably due more to supply factors than demand, although obviously both play a role to hike a card price up so high. Also, importantly, this card still sees lots of play in Standard. Will it drop at rotation? Maybe. But players in general are getting more savvy regarding MTG finance—thanks in large part to MTGPrice!—and many are not selling their eternal staples upon rotation from Standard. Snapcaster didn’t dip as much as we expected, nor did Abrupt Decay, and I frankly do not expect Thoughtseize to drop much at all. So although Standard is creating a demand for the card, it’s likely that Thoughtseize is never again available for lower than its current price—and if it is, it will only be slightly lower. 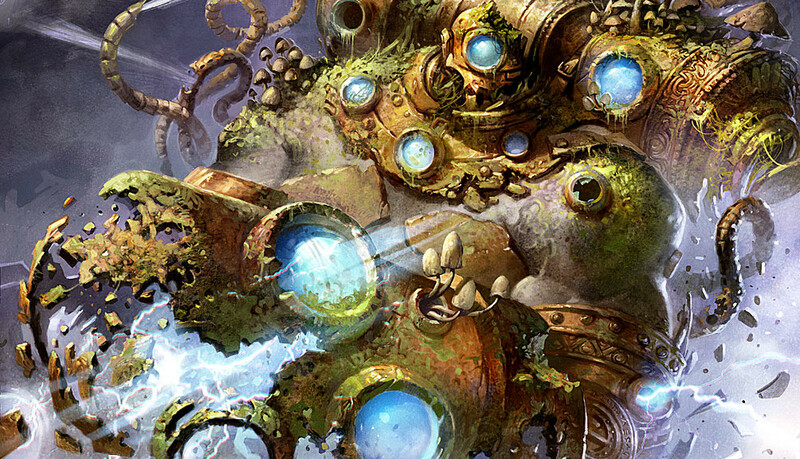 Could the $20 price tag on Thoughtseize be an indicator of what to expect for Abrupt Decay? Maybe, although the reprint and Standard-legal angles certainly make it hard to call this a direct analogue. Also, being two-colored as opposed to mono-colored makes Decay more narrow, which lessens demand. Despite these potential pitfalls, it doesn’t seem unreasonable to suggest that Decay should be between $20 and $50 based on similar-ish cards printed at similar-ish times. Unless there are other factors at play, that is. Cards’ individual values are often influenced by how valuable their home set is as a whole. This is in large part because singles are priced by retailers to make opening boxes of product worth it. This is a big reason why Voice of Resurgence started and remains so expensive: Dragon’s Maze didn’t have any other good cards! So if we look at Thoughtseize, we can see that Theros is generally a low-value set. Thoughtseize is the single most expensive card in it, and the ones that follow are mythics that are only good in Standard and casual formats. As far as eternal staples go, Thoughtseize is basically it. If it weren’t a reprint, how pricey would the card be, I wonder? Similarly, Snapcaster Mage comes from a set with only a few cards that see eternal play: Liliana of the Veil (at mythic), Geist of Saint Traft (also mythic), and Sulfur Falls are the top three. There’s plenty of casual goodies in the set, but the prices are top-heavy with the excellent competitive cards at the top of the list. In many cases, prices for the casual cards in this set are far lower than I would expect in general. Jace and Smiter are fringe players at Modern at best, but they do see occasional play and are worth mentioning here. Note that every card on this list is probably a little bit lower than we might otherwise expect. Coincidence? I think not. Because there is so much value in Return to Ravnica—and I’m not even considering the top casual cards like Utvara Hellkite and Chromatic Lantern—I believe the prices of all cards are suppressed. This probably explains in part why the shock lands have failed to perform so miserably. Now, as we get further away from booster boxes of RTR being commonly available, the price of the box will matter less and less to the prices of individual cards. But the box price is where card pricing derives from originally, and price memory is a powerful thing. Once the playerbase “knows” how much a card is worth, it’s hard to impact that without some major shakeups in supply or demand. Let’s say Abrupt Decay hits $20. Its current spread (the difference between the Fair Trade Price and the top buy price) is about 25 percent. So if its retail price hits $20, we can assume the buy price will settle in somewhere around $15. We’ve already determined the current risk is $3.08 to buy in today. And the gains if we hit $20? Only $2.52 per copy. Can Abrupt Decay go higher? Sure it can. We’ve seen Snapcaster climb as high as $50, but with the plethora of valuable cards in Decay’s set, the more narrow uses and decks it has compared to Snapcaster, and being from a set that was more opened than Innistrad, it seems highly unlikely to get anywhere close to Snapcaster. Now for my gut feelings: I don’t see a world where Decay hits $30 any time soon, but $25 may be possible. If it hits $25, then you’re making, what, $6.25 a copy? So now it comes down to whether you feel like it’s worth it to spend $12.48 to make $6.25 in about six months. Personally, I am not. If I had lots of extra dollars at my disposal, that might be a play I made, but with very limited funds I am willing to dedicate to Magic, I prefer opportunities where I can reasonably hope to double up, and I just don’t think that’s possible with Abrupt Decay. However, trading for copies is still totally on the table, especially if people are interested in soon-to-rotate Theros cards. And by no means should you be selling or trading copies of Abrupt Decay you already own—it’s basically free money to hold these until Modern Master 2015 is released. I just don’t think it’s worth buying. This article focused heavily on Abrupt Decay, but it really wasn’t about the individual card at all. My goal here was to show you the thought process behind choosing a speculation target and deciding whether or not it’s worth buying in. Do you have specific targets your’e looking at? Consider everything: the set they’re in, the supply, the demand, the formats they’re good in, how upcoming rotations and releases will impact them, the similar cards to other sets, etc. The more you analyze your potential spec targets, the more informed your purchases will be. And when you’re spending money on cardboard with pretty pictures, you generally want to be making informed purchases. Have comments? You know what to do.